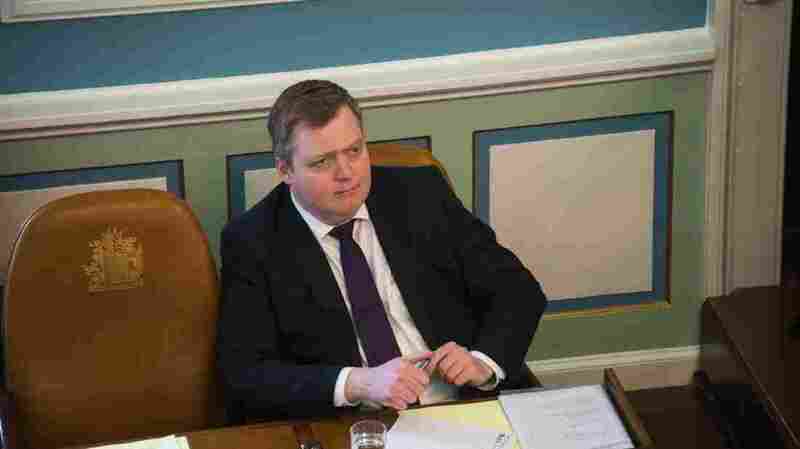 Iceland's Prime Minister Steps Aside Amid Panama Papers Scandal : The Two-Way Sigmundur David Gunnlaugsson says he is not resigning but another party official will take over for a while. The prime minister and his wife were implicated by leaked financial data. Icelandic Prime Minister Sigmundur David Gunnlaugsson attends a session of Parliament in the country's capital city, Reykjavik, on Monday. Icelandic Prime Minister Sigmundur David Gunnlaugsson said Tuesday that he will step aside and another party official will take over for a while. The move comes days after a massive data leak known as the Panama Papers linked him to secret offshore bank accounts. "Today the Prime Minister of Iceland Sigmundur David Gunnlaugsson has suggested to the Progressive Party Parliamentary group that the Progressive Party Vice-Chairman take over the office of Prime Minister for an unspecified amount of time. The Prime Minister has not resigned and will continue to serve as Chairman of the Progressive Party." Sigurdur Ingi Johannsson will lead the country, according to Godjon Helgason, a reporter at Icelandic National Broadcasting Service who spoke to NPR's Newscast unit. Johannsson, who is currently the fisheries and agriculture minister, "would take over as prime minister until elections [are held] next year — possibly sooner," Helgason tells NPR. He adds that for now at least, there's uncertainty over whether Iceland's president has formally accepted Gunnlaugsson's arrangements. As we reported yesterday, the data breach — a massive trove of leaked emails and other documents from a Panamanian law firm — has sparked dozens of reports from international news agencies. In Iceland, the leaked records portray Gunnlaugsson and his wife as owning a stake in Wintris, an offshore company seeking millions of dollars from failed Icelandic banks. The revelation sparked a public outcry, with thousands of people demanding the prime minister's resignation, Icelandic radio reporter Haukur Holm told NPR's Renee Montagne on Morning Edition today. "In recent weeks, the Prime Minister and his wife have provided detailed answers to questions about the assets of the PM's wife. They have never sought to hide these assets from Icelandic tax authorities and these holdings in Wintris have been reported as an asset on the Prime Minister's wife's income tax returns since 2008 and taxes have been paid accordingly in Iceland. No Parliamentary rules on disclosure have been broken." The statement concluded by saying Iceland's government "continues to use every option available to prevent tax avoidance." Earlier today, the Associated Press reported of Gunnlaugsson, "He also said his financial holdings didn't affect his negotiations with Iceland's creditors during the country's acute financial crisis. Those assertions did little to quell the controversy." Gunnlaugsson asked Icelandic President Olafur Ragnar Grimsson to call early elections and dissolve the current Parliament, the BBC reports, adding that Grimsson refused. On Sunday, the German newspaper Süddeutsche Zeitung, along with other international news outlets that collaborated on the Panama Papers story, published a wave of reports about the murky underworld of shell companies and offshore bank accounts that are sometimes used to avoid taxes and hide assets.